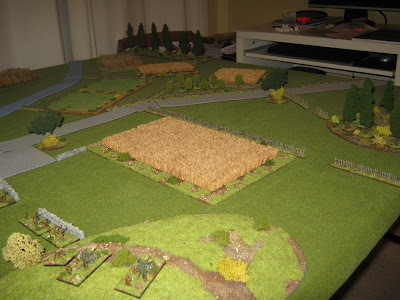 Well it has been some time since I have been able to update my Blog. A combination of the Summer hols with the family and that damned thing called 'work' have been to blame. Fortunately a window of opportunity presented itself over the weekend, so despite being a little under the weather, I managed to get in a game of AVBCW. The premise of this encounter was that the Army of the Severn Valley, loyal to Edward VII, having taken control of Bristol, was intent on pushing Eastwards towards Bath to secure their flank. The forces at their disposal consisted of the Kings German Legion and the Corpo de Spedizione Italiano. 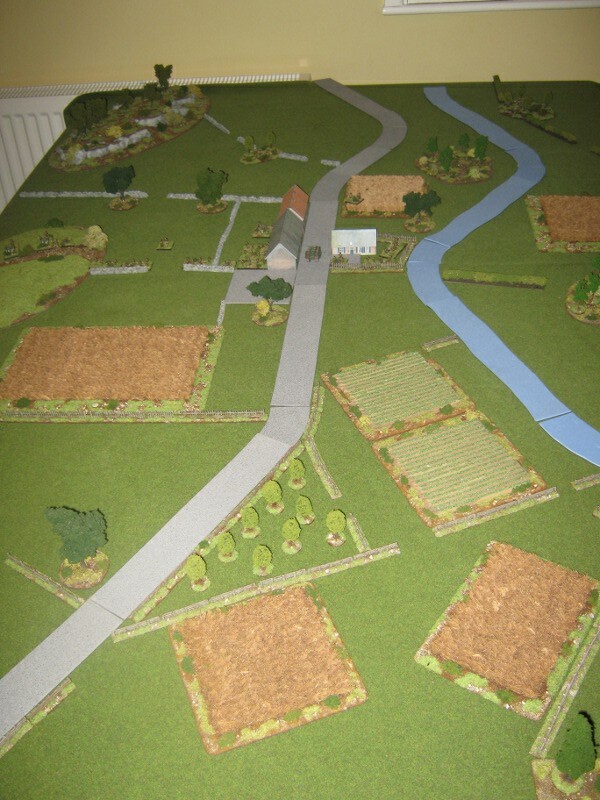 The scenario was loosely based around 'Breakthrough Attack' on p38 of BKC, with the objective of the AotSV of clearing the blocking troops from Swineford so that they could move on to more favourable positions nearer to Bath. 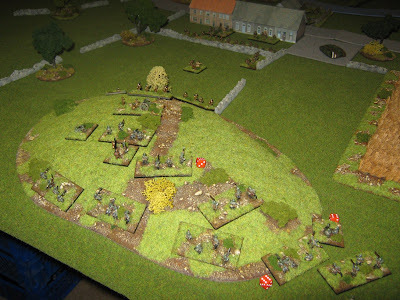 For the LAotS, they had to hold onto Swineford for as long as possible. RHA with a commanding view of the Bristol to Bath road. 3rd 'Bath' Battalion astride the road. Covering the ford on the Avon. The 735th Bandera under Seniore Bruno Calzolari, made a quick advance along the road, whilst the van der Deckens KGL came down from the hills around Upton Cheyney to take the RHA and supporting units by suprise in the flank, leading to the loss of one gun. 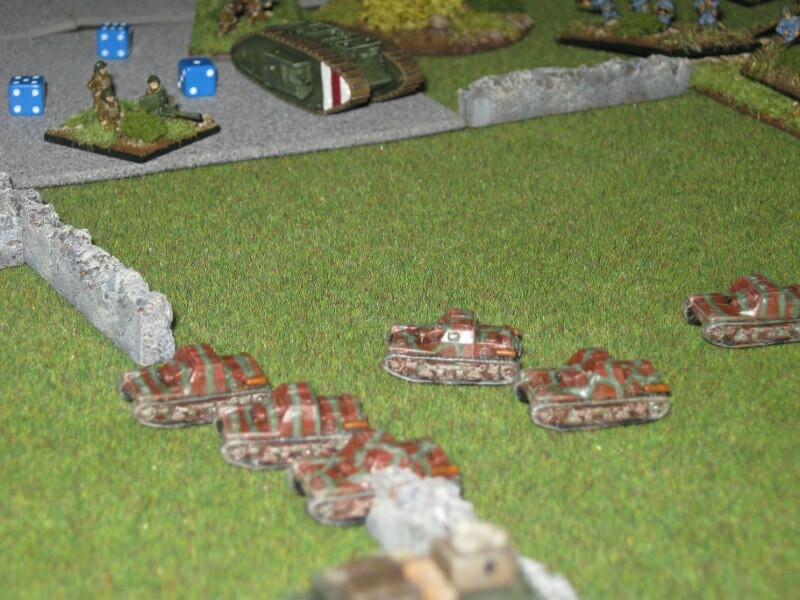 Console Marino ably supported this attack by quickly advancing towards the KGL. 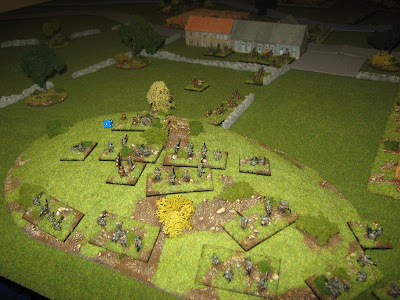 Captain Curruthers was shaken by this sudden threat to the flank, but LC Fletcher Vane, late of the Bengal Lancers, was used to flank attacks from this sort after his time on the North West Frontier, and calmly took charge. 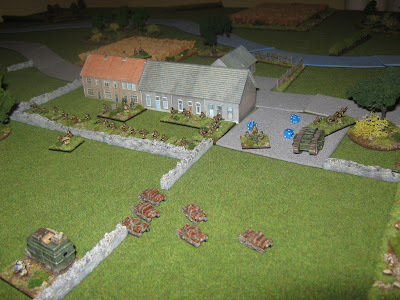 Mortar and artillery fire destroyed units of the KGL whilst the 'Beast of Bodmin' moved to support te threatened flank. 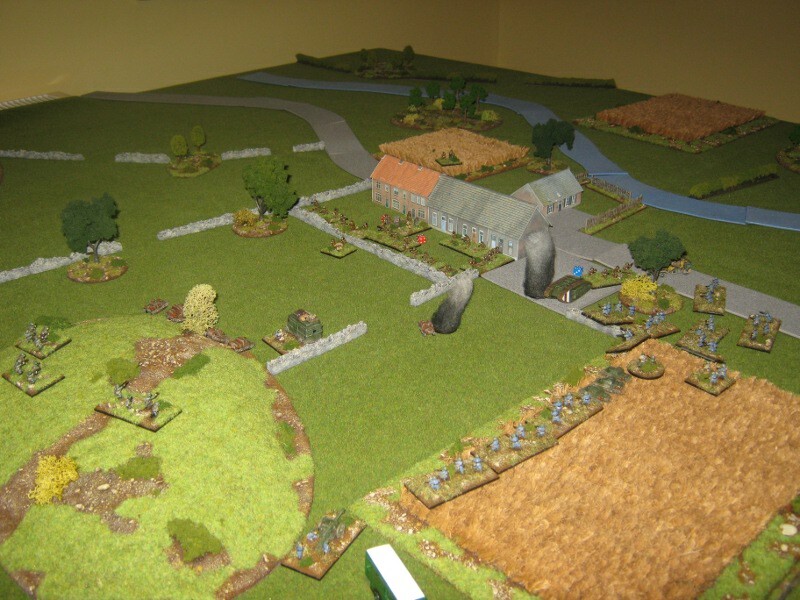 Calzolari's mortar supports the KGL attack and the 735th continue to advance. The KGL finish off the last RHA gun under initiative fire, then move and fire to keep the 3rd 'Bath' Battalion heads down. 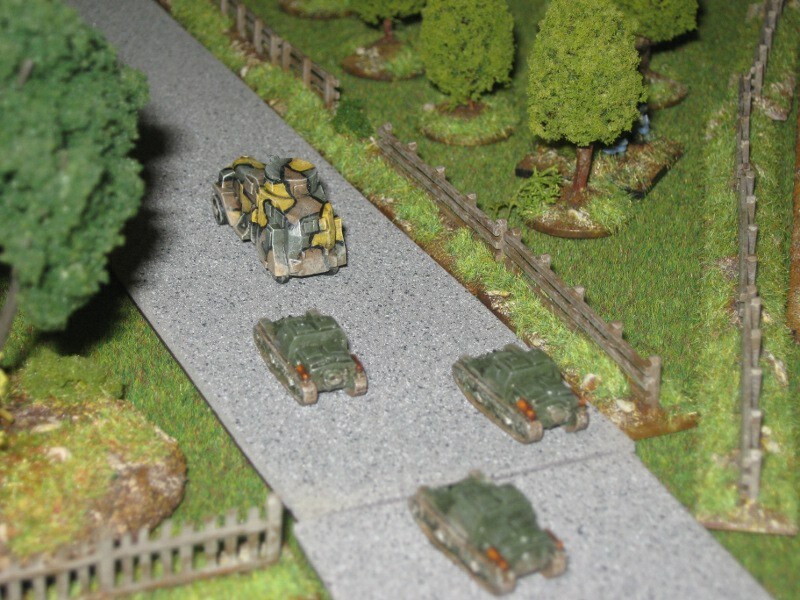 Console Marino moves into line with Calzolari ready for the attack. 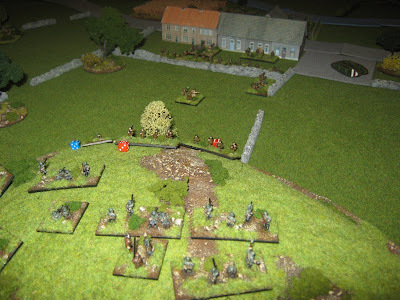 With the flank beginning to buckle under the attack from all sides, Captain Curruthers is not coping well with the situation. Once again Flecther Vane's cool head and experience shows as well directed mortar and fire from the 'Beasts' guns destroy and suppress more KGL units. 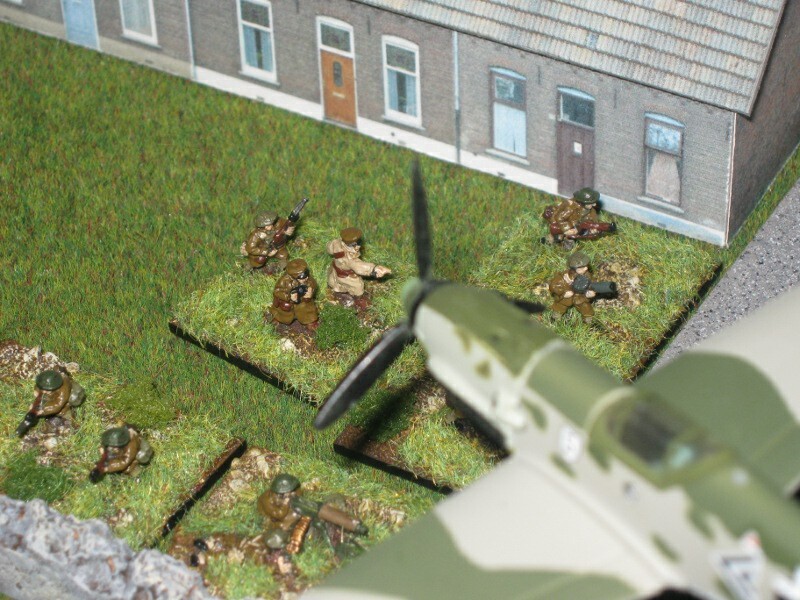 The 'Condor Legion' Bf-109 arrvies to support the attack on the hill. 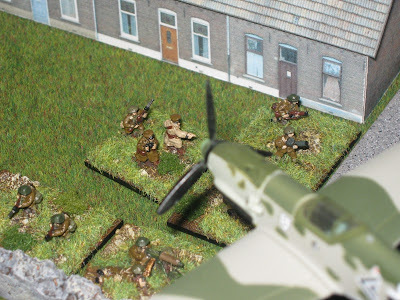 A little local flak is enough to send him off course lsightly so that he bombs and strafes both sides! 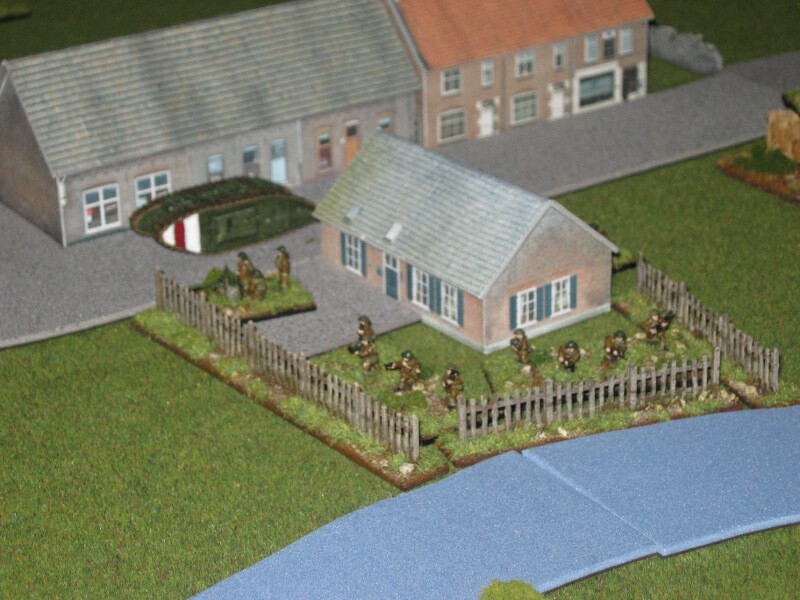 There is little movement as van der Decker and Console Marino dither as what is the best course of action. Captain Curruthers has now taken control of himself and moved what troops he can into better positions. 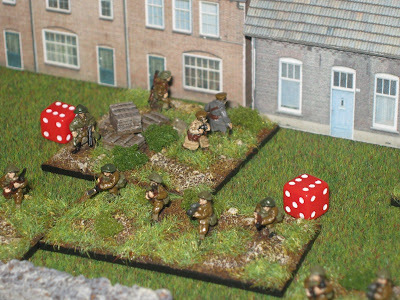 With the KGL behind the crest of the hill and the rest of the CSI out of sight, there is little for the 'Bath' boys to do. 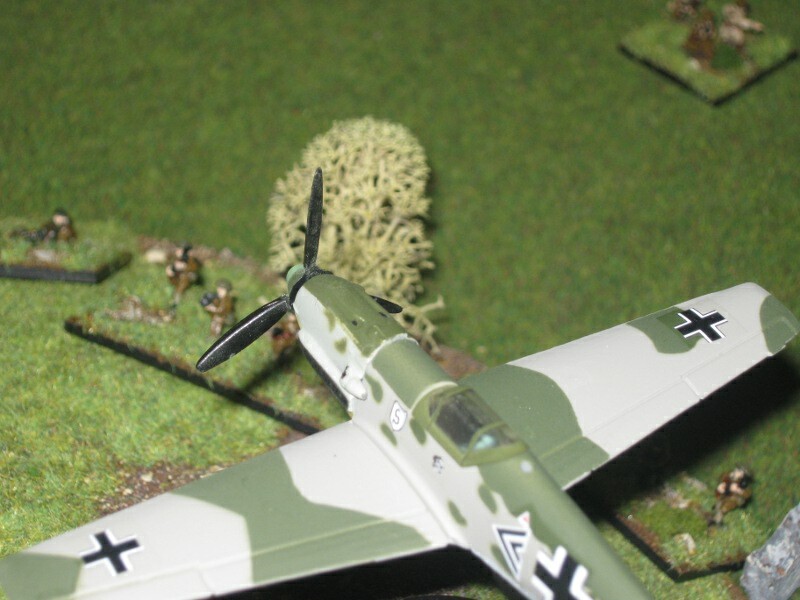 Once again the Bf-109 returns and hits the same KGL troops, who by now are less than pleased with his accuracy. 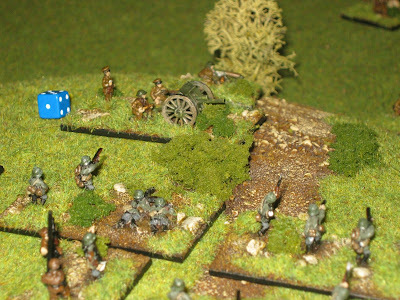 Despite this Blue-on-Blue, they continue to attack over the hill, only to be met by a hail of fire, suppressing some units and forcing others to run away. Calzolari troops, shaken by the fire and fury on the hill, choose to keep their heads down. 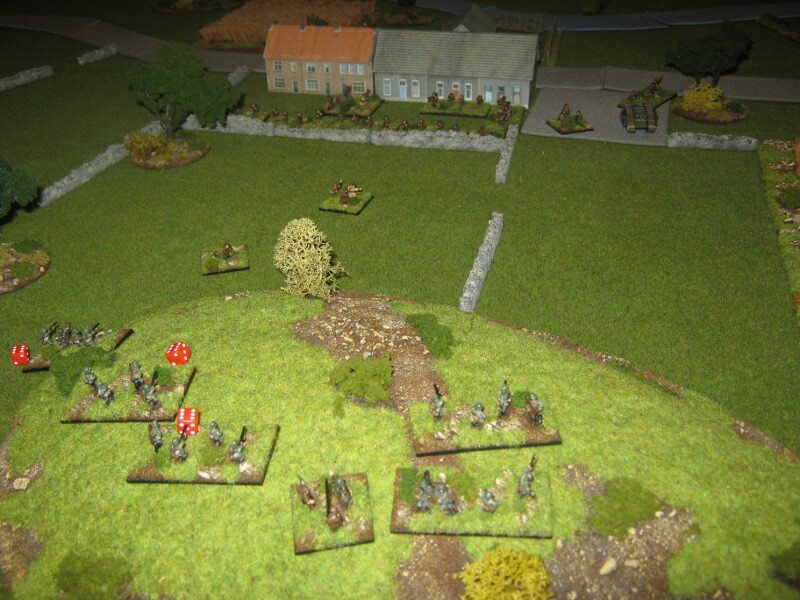 However, Console Marino and his troops make the most of the fire on the hill to move up close to the edge of Swineford. Captain Curruthers is definately not cool under fire and there are suspicions that he may be in league with the AotSV. 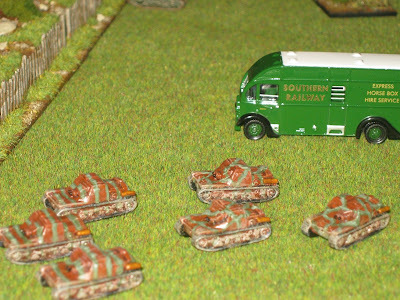 However, Fletcher Van is coolness personified and more mortar and MkV tank gunfire continue to take their toll on the hard pressed KGL. 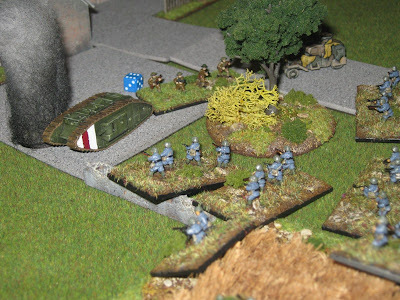 With the 'Bath' Battalion firmly esconced in Swineford, the CSI struggle to do much damage to them, despite Console Marino doeing his best to motivate his troops. Suspicions of Curruthers being in league with the enemy are swiftly removed as his troops poor fire into the KGL, killing and suppressing many units. 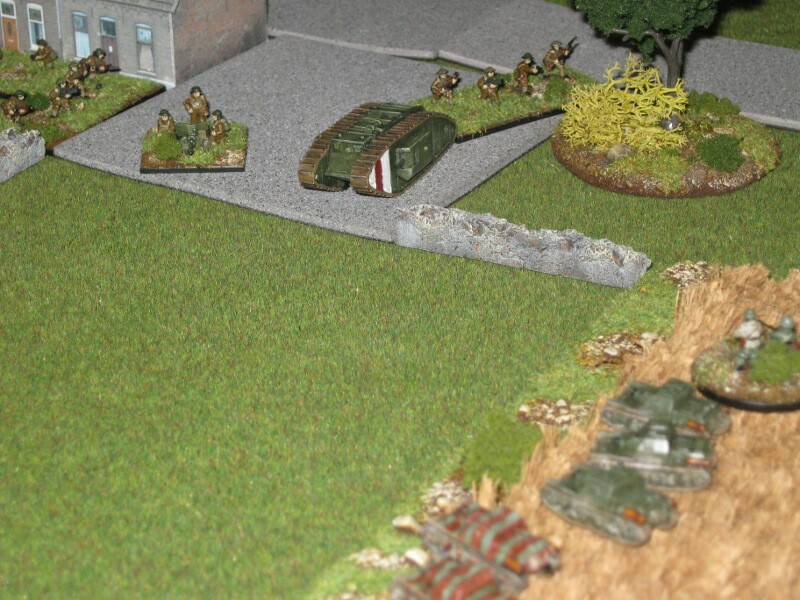 More fire from the 'Beast' suppresses the CSI infantry gun, the only major threat to it. Seniore Calzolari orders his troops to assault the 'Beast', but the attack is easily repulsed. 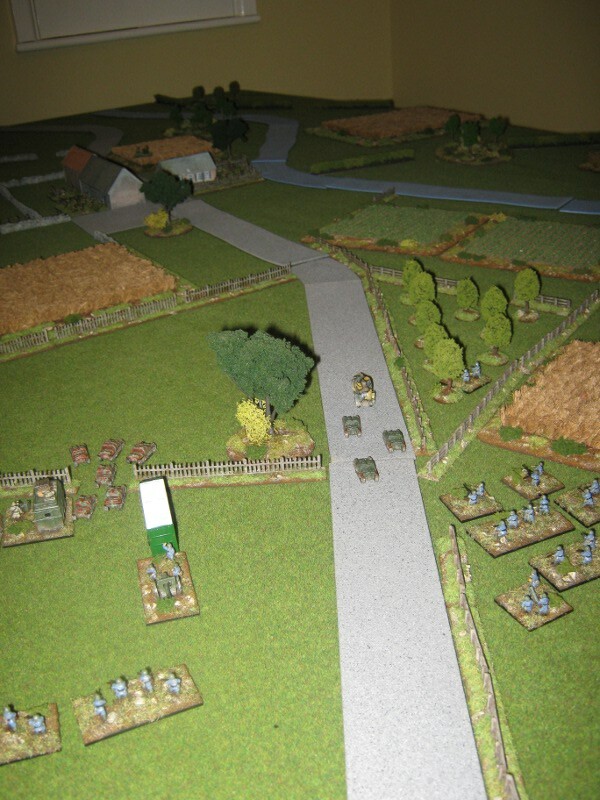 Van der Decken decides that discretion is the better part of valour and moves his troops back behind the brow of the hill to avoid the fire coming from Swineford. 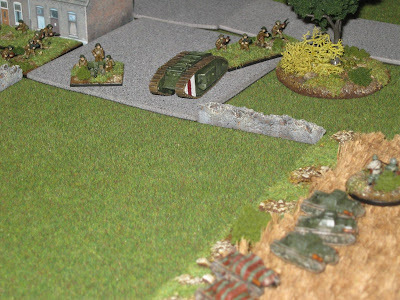 Console Marino orders the tankettes to make a dash through the gap in the wall in full view of the 'Beast' and the now redployed AT gun. Taking the 'Beast' and AT gun by suprise, they all make the gap bar one that is suppressed. 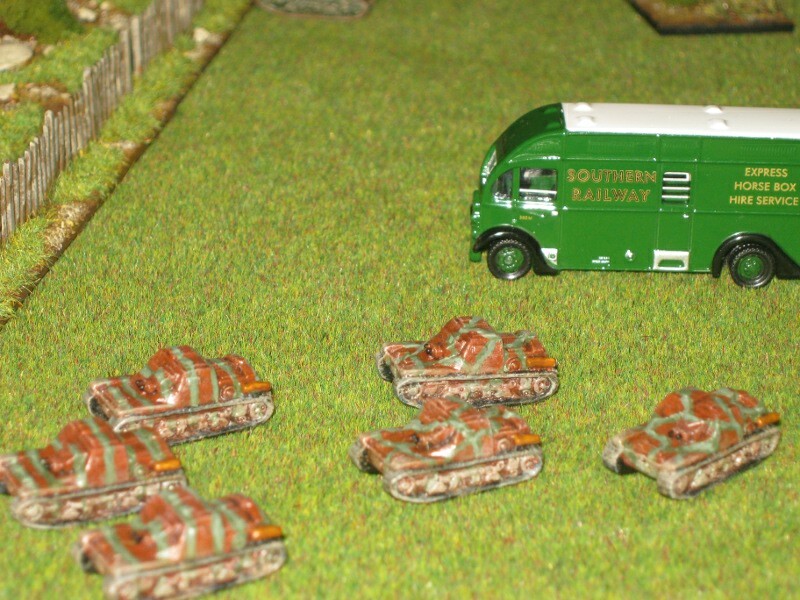 Fletcher Vane orders the 'Beast' and AT gun to pour fire into the exposed lanks of the tankettes. Despite 3 rounds of rapid fire, only one tankette is destroyed! 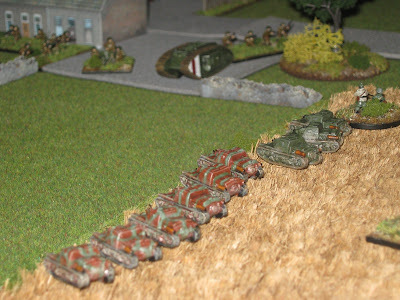 The tankettes make a run for it. 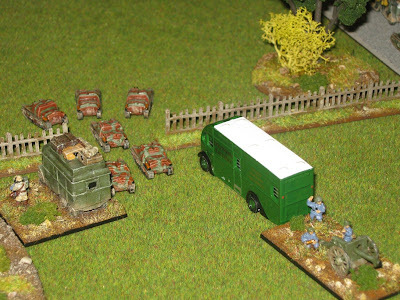 Despite such juicy targets, the 'Beast' and AT gun miss! The tankettes wisely use their initiative to move out of the way of the line of fire. 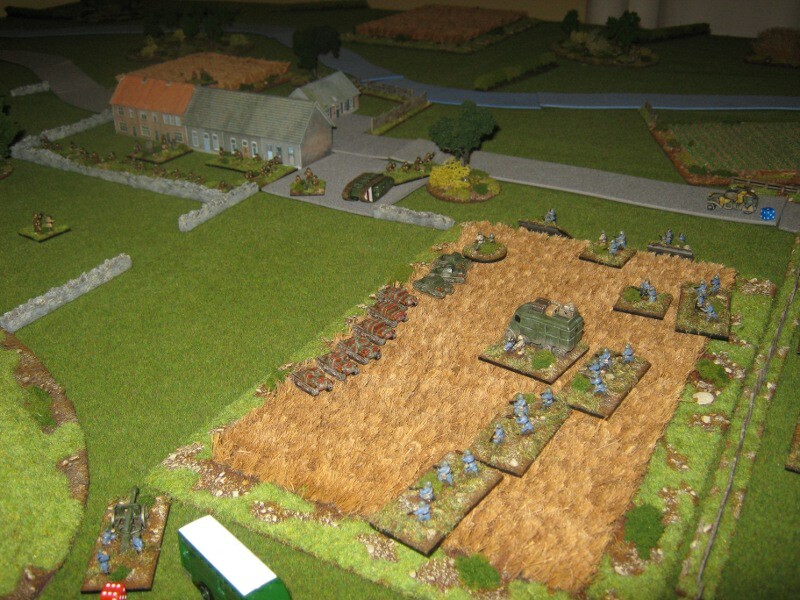 Calzolari's troops move up to get ready to assault into Swineford. Console Marino directs the fire with aplomb that leads to the 'Beast' and AT gun being destroyed, with Fletcher Vane being suppressed. Curruthers does his best with Fletcher Vane out of action, but the writing is on the wall. 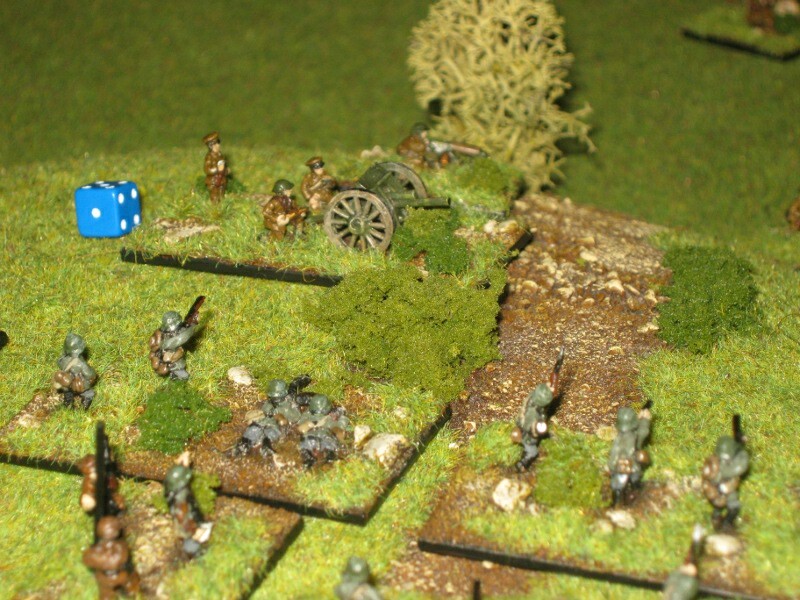 The 'Bath' Battalion are close to breaking point. The Bf-109 arrives again to add support to the final assault, but achieves litte due to the confines of the built up area of Swineford. 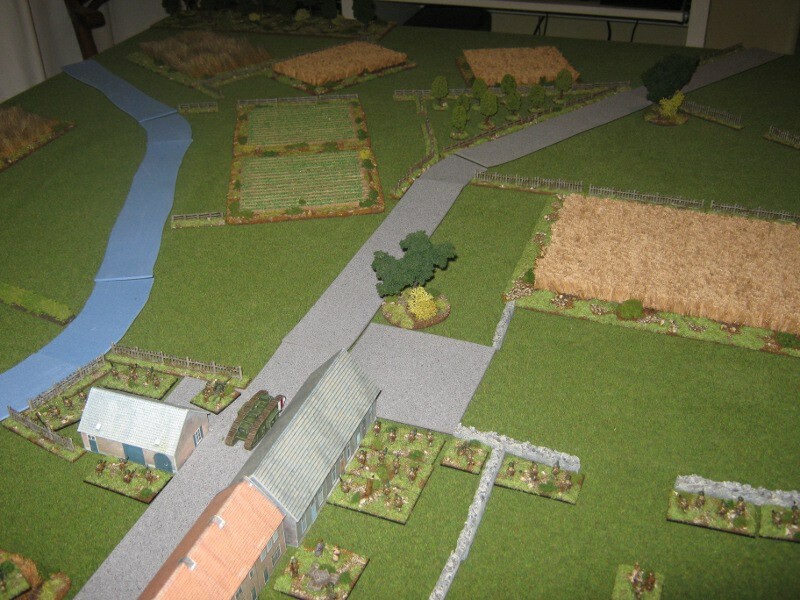 Calzolaris troops assualt into Swineford, with mixed results, but the 'Bath' Battalion are now pass their breakpoint. 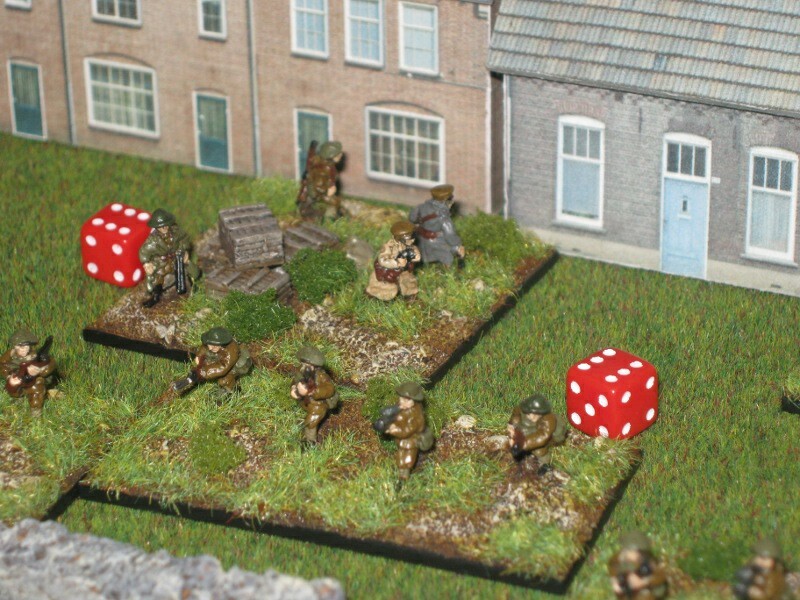 Fletcher Vane passes his break test on -2 to the die roll, but the game is really over as they are threatened on all sides. 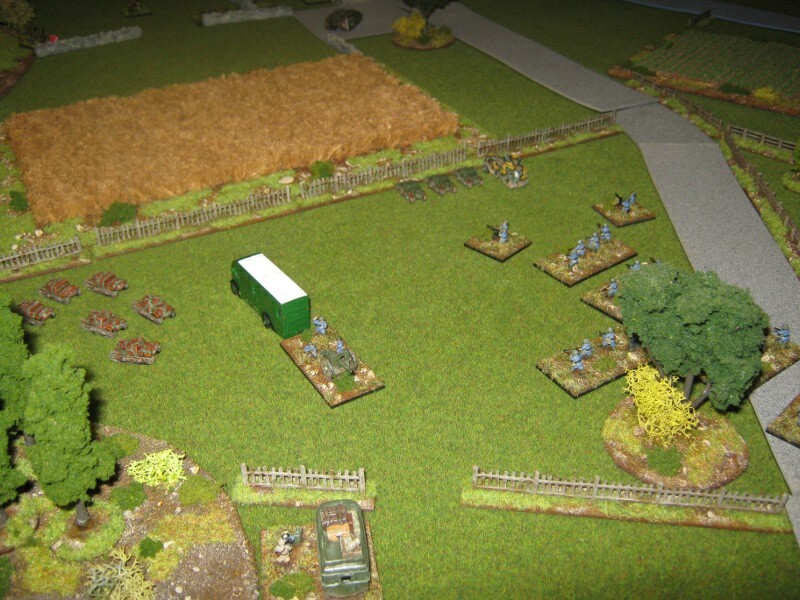 With the CSI closing in for the kill, Fletcher Van wisely decided to make a strategic withdrawl to preserve his forces for another battle. Despite the CSI winning, they had suffered equal losses to the 3rd 'Bath' battalion, especially the KGL that was a shadow of it's former self. So in the end I decided that it was an honourable draw. Even though this was a quickly set up AVBCW game, I very much enjoyed it, as always. What I really need to do is come up with a more detailed background for all the forces and factions in and around the Bristol area that I live, similar to that done by Nik Harwood. So apart from trying to find tie to paint up more of my figures, I need to sort the background out. Brilliant game. Great, original way for using BKC.